S. Mori, S. Wakana, L.M. Nagae-Poetscher, and P.C.M. van Zijl. Amsterdam: Elsevier; 2005, 284 pages, $195. Diffusion tensor imaging (DTI) is becoming increasingly available on clinical scanners, thus providing neuroradiologists and other investigators with the ability to assess and quantify white matter abnormalities in ways that were impossible with conventional MR imaging methods. DTI is an MR imaging technique that is sensitive to the diffusion of water in anisotropic tissue and is thus ideal for the imaging and characterization of white matter fiber bundles. Because of the complexity of white matter anatomy, the localization of tracts is difficult without a good understanding of their 3D relationships. This volume provides annotated 3D and cross-sectional maps derived from DTI data and is intended to enable the interpretation of the complex 3D white matter anatomy visualized with DTI and the identification of specific white matter tracts. Chapter 1 includes a brief introduction to the creation of DTIs. DTI allows the measurement of local white matter fiber orientation that can be visualized by coloring the anatomy according to a coded direction with intensity proportional to diffusion anisotropy. The color direction maps seen in this atlas and available on clinical scanners visualize the local white matter orientation by using 3 colors—red, green, and blue—representing the 3 axes. In this atlas, red is left-right, green is anteroposterior, and blue is inferior-superior. Note, however, that these colors are not always consistent on different scanners and systems. Tracts at oblique angles are represented by combinations of the colors corresponding to the orthogonal axes and thus are more difficult to interpret. The authors point out an important limitation of DTI that is essential in interpreting the color maps. Because of the relatively large size of the pixels in the DTI data (2–3 mm), a pixel often contains an intermingling of axonal tracts with multiple orientations. As a result, these pixels have diminished anisotropy and will appear as dark regions. It is important that these regions of low anisotropy are not interpreted as having a low content of axonal fibers. Chapter 2 describes the data and methods used for the creation of this atlas. The most difficult aspect of the methodology is the identification of tracts with the aid of tractography methods. The FACT (fiber assignment by continuous tracking) method developed by the authors allows for the detailed identification of tracts throughout the white matter. This method uses a combination of automated tracking with local integration of the diffusion directions, assisted by manual delineations. The manually defined regions of interest help to edit and sort out those fiber paths with similar trajectories. This process, based on the known anatomic courses of the tracts, enables the subdivision and labeling of the white matter and the creation of the parcellation maps shown in chapter 4. 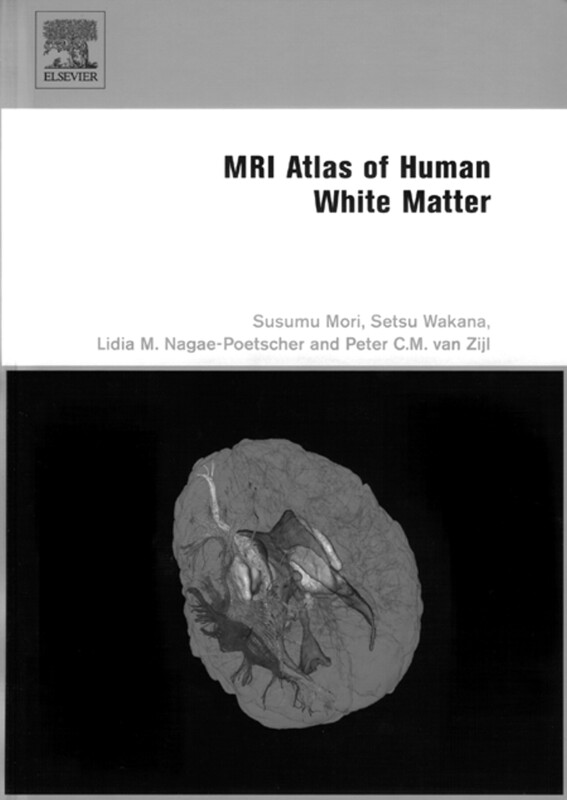 Chapter 3 provides a 3D atlas of 4 groups of white matter fibers: tracts in the brain stem, and projection, association, and commissural tracts in the cerebral hemispheres. Five tracts were reconstructed in the brain stem: the superior, middle, and inferior cerebellar peduncles, the corticospinal tract, and medial lemniscus. The images of the 3D trajectories of the tracts are accompanied by multiplanar images at various section levels and orientations. 3D trajectories, accompanied by multiplanar images at various section levels and orientations of the following association fibers, are demonstrated: the superior longitudinal, inferior longitudinal, superior fronto-occipital, inferior fronto-occipital, and uncinate fasciculi. Also presented are the 3 major fiber tracts of the limbic system: the cingulum, fornix, and stria terminalis, as well as the commissural fibers of the corpus callosum. Chapter 4 constitutes by far the greatest segment of this book and is a 2D atlas of the previously mentioned white matter tracts. The 2D atlas is arranged in a series of axial, coronal, and sagittal images. Two types of color images are shown: direction maps and parcellation maps. Multiple sequential 2D color direction maps of the various tracts are presented, accompanied by parcellation maps shown with matching T1-weighted images and superimposed color-coded tracts derived from the tractography and parcellation methods described in chapter 2. The parcellation map shows the segments of the tracts seen at each level. The level of each color map and the accompanying T1-weighted parcellation image is indicated by a line on 2 orthogonal T1-weighted sections. Colors have been arbitrarily assigned to the tracts that have been delineated and are indicated by the color of the label on the direction maps. White labels indicate structures that have not been specifically delineated or represent alternate nomenclature, such as the external capsule. The corticospinal tract is, however, confusingly also labeled white. Labels, unfortunately, are not indicated directly on the parcellation maps, which can lead to confusion, especially for many similar-appearing colors. In contradistinction to the excellent labeling of the color direction maps, the utility of the parcellation maps is significantly limited by the lack of labeling. Also, the image quality of the underlying T1-weighted image in the parcellation map, especially in the sagittal and coronal sections, is diminished by the size of the pixels, though it may not have been technically feasible to interpolate. In general, the utility of the parcellation maps is reduced by the somewhat arbitrary-appearing delineations (gaps, extraneous portions) that are an artifact of the parcellation process. Tractography and parcellation are still quite challenging problems, and current methods at current resolutions do not yield perfect maps. Although the authors acknowledge that the identification of the fiber tracts on DTI would not be possible without the anatomic knowledge gained from postmortem anatomic studies, the anatomic section in the reference list is surprisingly limited. The authors may have benefited from a larger selection of anatomic references, which includes more of the anatomic dissection studies, and the correlative anatomic and MR studies, which have been published in the past 20 years. The readers would benefit from an expanded anatomic and MR reference list. Overall, this book is an important contribution to the field of DTI and is a very valuable new contribution in this burgeoning area. The major section of the book, consisting of the numerous sequential color maps with their level identified in the 3 orthogonal planes is a helpful guide to the interpretation of DTI, despite the limitations of the parcellation maps. We highly recommend this book for neuroradiologists and other investigators who are working with DTI.